I am really enjoying Daz Studio dForce and have been experimenting with wind nodes. In the Pink Lady image below, I used the adorable dForce Sweet Anime Outfit with a wind node below the dress, pointing from the girl’s left to right. After running several different simulations, I got one frame or pose that I really like and would want to save for future use. Can I save a dForce pose? How do I do this? The short answer is yes, we can save a Daz Studio dForce frame as a morph. In this tutorial, I will describe the steps I use to save a frame from the dForce Sweet Anime Outfit. Go to the dForce frame we want to save. Right-click on the dForce Sweet Anime Outfit and unparent it from our Genesis 8 figure. 1. Right-click on the dForce Sweet Anime Outfit and unparent it from my Genesis 8 figure. Delete everything else from the scene except for the dForce Sweet Anime Outfit. Zero out all other pose and shape settings on the dForce object. Zero out all other pose and shape settings on the dForce object. This will ensure that the object mesh that we are saving only has the dForce simulation changes applied to it. I zero out my dForce dress by right-clicking on it and then choose Select > Select Children. 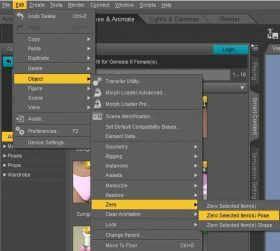 Then, I do Edit > Object > Zero > Zero Selected Item(s). Set the Mesh Resolution of our dForce object to Base. Go to the Parameters tab and set General > Mesh Resolution > Resolution Level to Base. This ensures that our saved mesh will properly match with the original object mesh. This is important in the next section when we use our OBJ file as a morph. Set Save as type to Wavefront Object (*.obj). Do File > Export and set Save as type to Wavefront Object (*.obj). I name my OBJ file based on what I want to call my morph parameter. 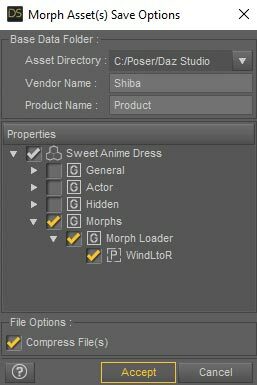 For example, in the case of the pink dress morph, I name my file WindLtoR. 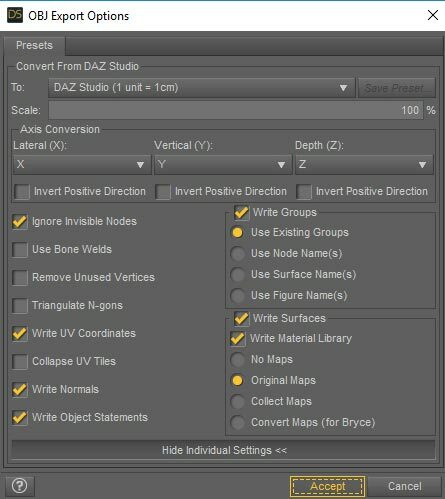 For the OBJ Export Options, I use the Daz Studio defaults (see below). For the OBJ Export Options, I use the Daz Studio defaults. At this point, we have an OBJ file of our simulated dForce dress. Load the base Genesis 8 figure (make sure pose and shape are zeroed out). Fit the dForce Sweet Anime Outfit to our Genesis 8 figure. 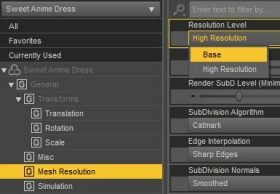 Select our dForce dress and go to Assets > Morph Loader Pro. Go to the Scene tab and select the dForce Sweet Anime Outfit. 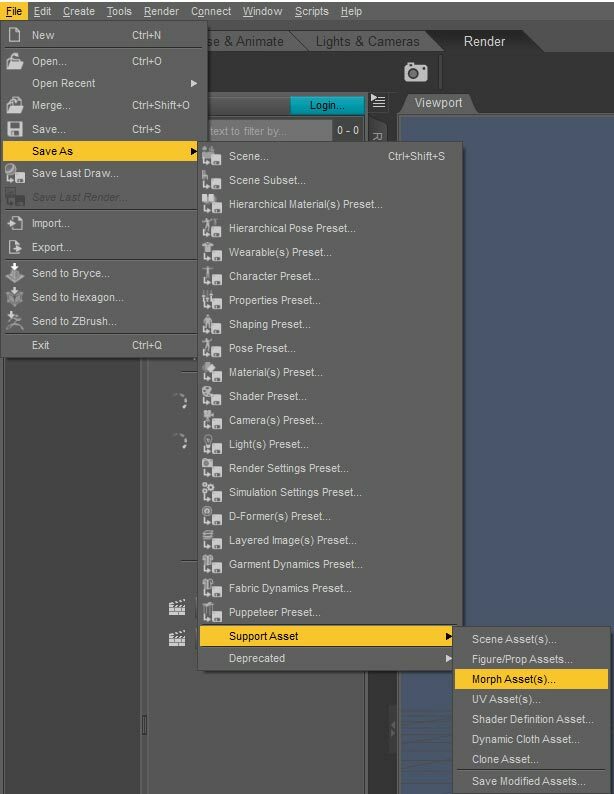 Click on the triangle and lines menu button and select Assets > Morph Loader Pro (see right). 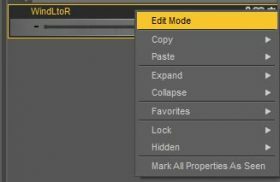 Click on Choose Morph Files and select the OBJ file we saved in the previous section (see below). Hit the Accept button and hopefully the morph will load successfully. A common reason for failure is when the OBJ file mesh does not match with the original object mesh. This is why we want to make sure that the OBJ file only contains the pink dress object and nothing else. In addition, we need to set the Mesh Resolution Level to Base (as outlined in the previous section). 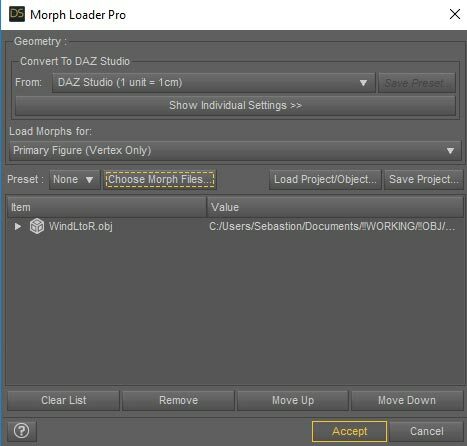 Click on Choose Morph Files and select the OBJ file we saved in the previous section. 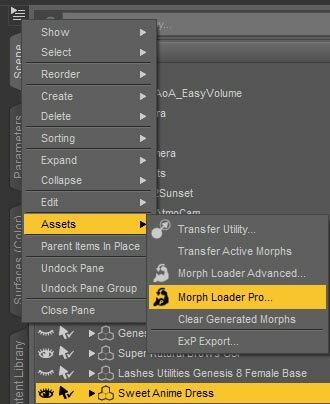 If our morph loaded successfully then it should appear in the Parameters tab under Morphs > Morph Loader. Dial in the morph to see how it looks on our figure. If our morph loaded successfully then it should appear in the Parameters tab under Morphs > Morph Loader. Right-click on our new morph parameter and select Edit Mode. I just use the default ERC Freeze Options and click Accept. 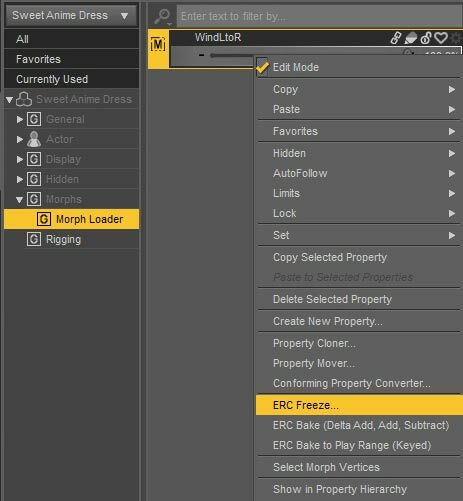 In the Morph Asset(s) Save Options interface, deselect everything and only click on our new dForce wind parameter (e.g. WindLtoR). 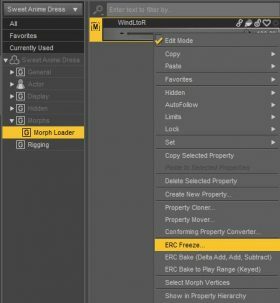 In the Morph Asset(s) Save Options interface, deselect everything and only click on our new dForce wind parameter (e.g. WindLtoR). I also set Vendor Name to Shiba. Click on Accept. We are all done! Now when I restart Daz Studio and load in the dForce Sweet Anime Outfit, I have my WindLtoR parameter under Morphs > Morph Loader (see below). Now when I restart Daz Studio and load in the dForce Sweet Anime Outfit, I have my WindLtoR parameter under Morphs > Morph Loader. Go to Daz Studio Content Directory > data. Do a search for my OBJ file name, for example WindLtoR. 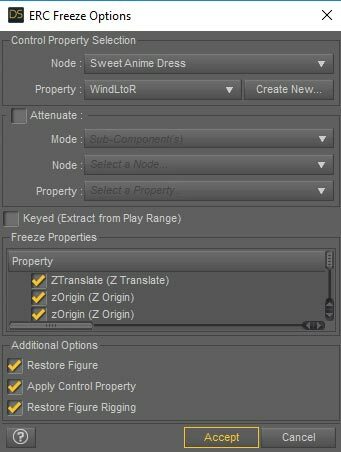 In this case, the file was in Daz Studio Content Directory > data > nikisatez > G8FSweetAnime > Sweet Anime Dress > Morphs > Shiba > Product > WindLtoR.dsf. Delete WindLtoR.dsf to delete our newly saved morph. Daz Studio dForce simulation applied to the dress of the fantasy girl. Why can’t I just save my dForce simulation result as a pose? As I understand it, a pose captures changes made to the bones or rigging of a figure. For example, a pose would be bending the forearm of a figure and turning her head. In contrast, a morph captures changes made to the mesh of the figure. For example, different face shapes or body musculature. A dForce simulation operates on the mesh of the figure, which is why we are able to get much nicer cloth drapes than what is possible with just rigging. As a result, to save a dForce frame, we will need to save it as a morph. 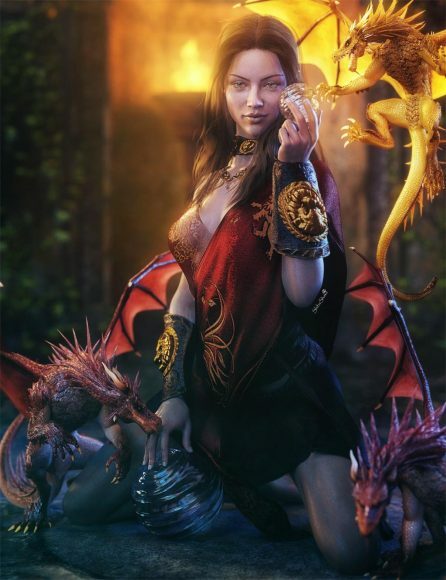 Daenerys Targaryen, Game of Thrones Fan-Art. Daz Studio dForce simulation applied to her white dress. 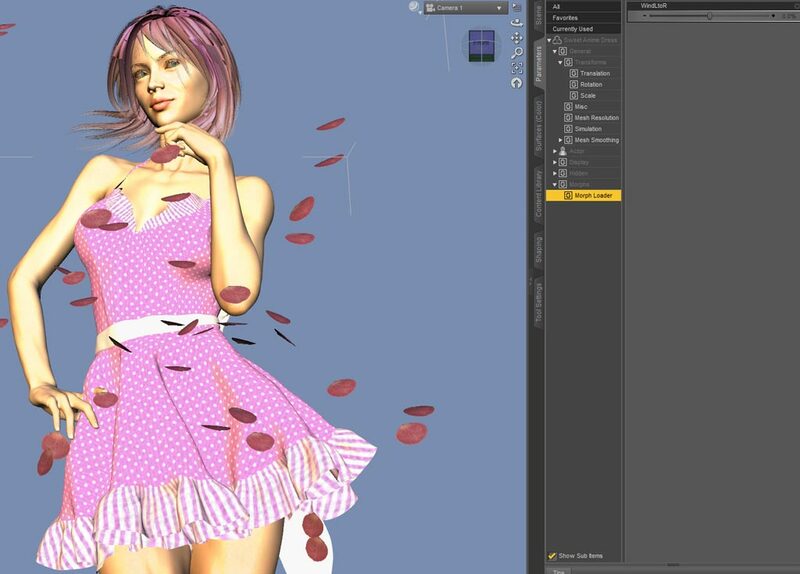 A beginners tutorial on Daz Studios new dynamic cloth system - dForce. In this tutorial, I apply dForce to two pieces of V4 clothing, so that it drapes over a Genesis 8 Female figure. With dForce, I can not only use Poser dynamic dresses on Genesis figures, but also older V4 dresses that did not autofit well on Genesis. To facilitate sharing scene files, we may sometimes only want to save-out one or several frames in our Daz Studio scene. This tutorial describes a simple process to do this. You do very good tutorials! 🙂 Thanks! I could see where this would come in especially handy if exporting to another program such as Vue. this is a wonderful technique. thanks for sharing!